It is October half term and we are in Mallorca for the week. We’ve got our Asus Eee PC (called Bert) with us, so it seemed like a good way to see how it would be for blogging using a not so great WiFi signal. In August we found a cheap self catering package deal to Pollença, so we have a week of cycling, walking and relaxing (for various values of “relaxing”; for Adam this seems to be throwing himself at hard cycle rides; for Philippa this is sitting by the pool drinking wine) to enjoy. We didn’t bother to fly with our bikes to Mallorca because it’s easy to hire good bikes in Pollença from 2GoCycling. We’ve got a couple of BH Quartz bikes, which come with Shimano Ulterga & some version of Shimano disk brakes. (Google tells me BH are a Basque company, with 50 % of their sales in Iberia, which probably explains why we’ve never heard of them before.) These seemed an easy way to test out a carbon disk braked bike without the initial capital outlay of an outright acquisition. However, that may not have worked out very well because after 40 km of cycling Philippa has updated her Christmas list. Today we cycled from Pollença to Formentor lighthouse, which is a 20 km dead end road that is either pointing upwards or downwards. 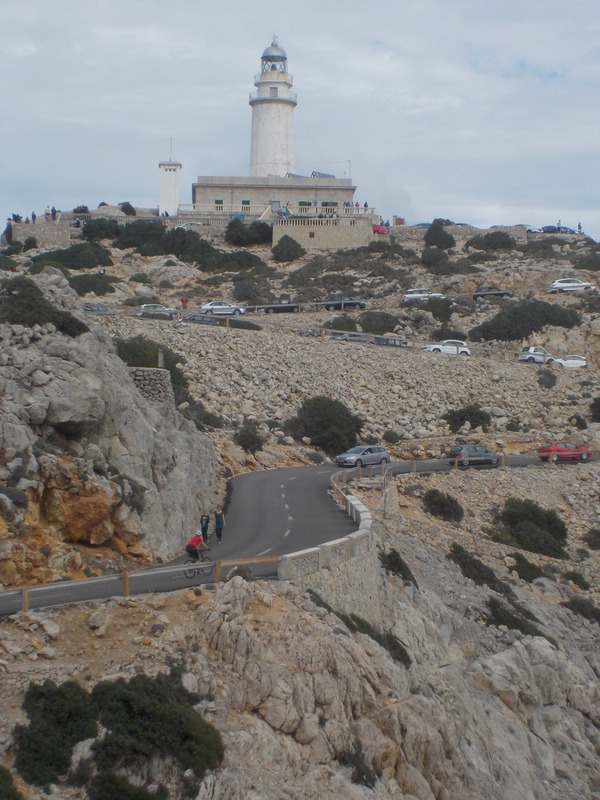 It was built by Antonio Paretti, who also built the road to Sa Calobra. It was 40 km of stunning views and silky smooth tarmac. At the lighthouse there is the hilarity of watching the car drivers fight over the few car park spaces. Whilst we were sat around admiring the views Adam got congratulated on completing Paris Brest Paris by a Brit, so the jersey is good for something! The climbs were all fairly gradual, while the descents were a blast, especially on a responsive bike with disc brakes. However, we had to keep alert to the fact the brake levers are the opposite way round to the UK.